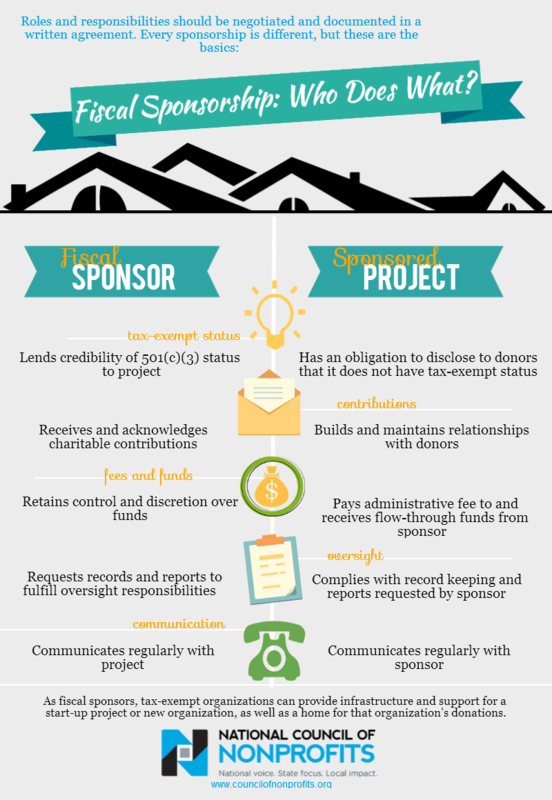 Cropped from the infographic “Fiscal Sponsorship: Who Does What?” from the National Council of Nonprofits. However, as nonprofit practitioners, we need raise an issue near and dear to many community organizations. We are writing to ask you to change one practice that would make a tremendous difference to thousands of well-vetted and impactful charitable initiatives operating all over the US. When allotting (or directing TechSoup to allot) donated licenses to nonprofits, we ask that you accept initiatives hosted by public charity fiscal sponsors so that thousands more nonprofit groups can benefit from the valuable tools and services you provide. Our understanding is that your companies have historically relied on independent 501c3 status to verify donor eligibility. However, many charitable programs have no independent EIN/501c3-status. This is because they choose to be fiscally sponsored by another 501c3 public charity. 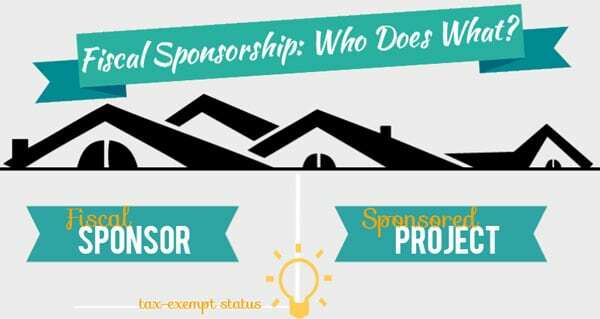 Under this model, the fiscal sponsor charity serves as the legal host to one or more mission-aligned initiatives, providing them with critical infrastructure and back-office supports. This innovative and well-recognized approach allows these groups to focus on their important work while critical back-office and compliance functions are managed by their trusted partner. Professional fiscal sponsor charities, in turn, adhere to the highest standards in nonprofit management and best practices in fiscal sponsorship established by the National Network of Fiscal Sponsors. As a result, charitable initiatives partnering with competent fiscal sponsors are generally more effective and stable than the average small nonprofit. While nearly anyone can simply file a 1023-EZ and become a 501c3 (including documented hate groups)—thereby granting them immediate access to your donations—impactful initiatives led by people of color, LGBTQ, women, and people with disabilities increasingly embrace the fiscal sponsorship model as the one that allows them to best advance their missions. Thus, a disproportionate number of groups negatively impacted by your current practices are those led by folks that have been systematically denied equitable access to just about everything else in our society. Community-facing nonprofits are reliable stewards of our core societal values and deserve the best the tech world has to offer regardless of how they meet their back-office needs, so long as done so in a legally appropriate manner. Who you choose to include and exclude when you donate your products speaks volumes about your values, and we urge you to consider a more inclusive approach. Vu Le (“voo lay”) is a writer, speaker, vegan, Pisces, and the Executive Director of Rainier Valley Corps, a nonprofit in Seattle that promotes social justice by developing leaders of color, strengthening organizations led by communities of color, and fostering collaboration among diverse communities. Known for his irreverent sense of humor and love of unicorns, Vu has been featured in dozens, if not hundreds, of his own blog posts at NonprofitAF.com, formerly nonprofitwithballs.com. Josh Sattely, Esq., is Director of Legal Affairs at TSNE MissionWorks. As Legal Director, Josh develops and leads MissionWorks' policy, regulatory, contract and compliance programs and serves as an expert resource on the organization’s legal structure and governance. The role of corporations in advocacy on social issues is changing as we speak, but what will that mean for the role of nonprofits and government? Weigh in.